When talking with new gardeners I am often asked what vegetables I would recommend for beginners to grow. To their surprise I often suggest Swiss chard and the usual response is "what’s that?" 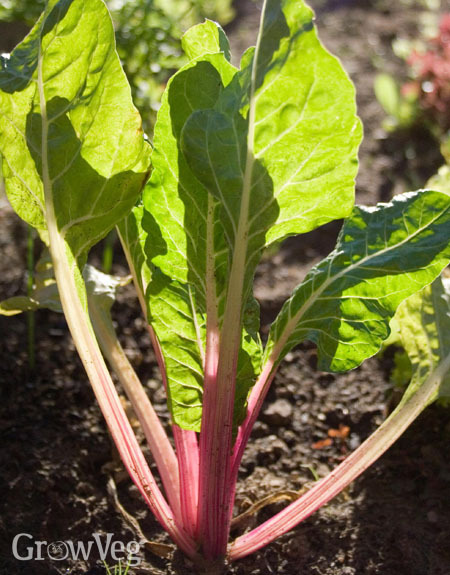 Chard is one of the most versatile vegetables available and will keep cropping from early summer right through winter. Not only that but it is incredibly easy to grow, suffers from almost no pests and will withstand most forms of neglect in a garden – erratic watering, competing weeds and even poor soil. Chard is a member of the beet family and shares many of the same characteristics. It also goes by the names of ‘leaf beet’ and ‘spinach beet’. Although you can sow it directly into the soil, my preference is to start it off inside in 3 inch pots. Each seed is actually a cluster of seeds which will usually sprout together. One of the most important things to do at this stage is to cut off all but one of the seedlings at the base, so that they don’t compete against each other. The other big advantage of sowing the seed in pots is that you can quickly discover the colour of the plant stems – useful if the pack of seeds contains a mixture of varieties as is very common. Ruby Chard – deep red stems with a deep green leaf. There is also a variety that sometimes comes in mixes such as ‘Bright Lights’ which has a dark bronze-coloured leaf. A related type ‘Rhubarb chard’ is very similar with thicker stems. Gold Chard – bright yellow stems with glossy green leaves. Pink Chard – often with a beautiful striped pink-and-white effect along the stems and light green leaves. Orange chard – somewhere between the bright reds and yellows. White Chard – thick white stems and wide green leaves, this is often the most productive variety with some even being described as silvery in appearance. The colours are so striking that they can easily form the basis of a colourful garden display – my neighbour who grows a beautiful array of flowers in his garden recently asked what ‘those bright coloured plants’ were in my vegetable patch, as they make a striking feature. As well as colourful types there are specific varieties bred to be a substitute for spinach. These tend to have thinner white stems but the leaves are softer and less ‘leathery’ in feel. The great advantage of these over spinach is that they don’t bolt as easily so you get a good crop over a longer period of time, particularly during hot weather. They also survive in much colder weather making a good autumn crop. My favourite type for this kind of cooking is one which is often not even called chard but is labelled ‘Perpetual Spinach’. Perhaps the reason that people are unfamiliar with chard is that few supermarkets and grocery stores stock it. To the uninitiated it may seem a little tasteless and the leaves are thicker than many of the leafy vegetables we cook with. However, I find it works very well in dishes where you are looking for additional texture and colour, whilst letting the taste come from other ingredients, herbs or spices. The stalks give a similar crunch to celery when cooked and the leaves can be shredded and added towards the end so that they retain their high vitamin content. Generally it is advisable to let the leaves quickly boil (rather than steaming) to reduce the oxalic acid, making them slightly sweeter. Try stir frying it with soy sauce, chopping it into stews, adding to minestrone soup or any of these ideas for cooking with green vegetables. Baby leaves can also be used to add colour and texture to salads. Altogether, chard is a hidden gem in the vegetable garden. It has an impressive list of heath giving qualities that put it up there with many ‘superfoods’ and it qualifies as a great source of year-round greens. Just two sowings, one in late spring and the other in late summer, will give a good crop almost right through the year. So, while it may not be well known in gourmet circles, it makes a valuable addition to the vegetable garden yielding a great crop for the space it takes up. Not just a choice for beginners, I think almost every vegetable garden should include this versatile plant. "I will certainly try it"
"I grow swiss chard all the time. This year though the chard was eaten by an "invisible" bug of some sort. I had to put diatomacious earth on the leaves which helped most of the time. It almost looked like japanese beetles had gotten to them. Otherwise it's the only vegetable that has stood up to this particular rainy summer." "I have been growing the white chard in particular on my allotment for a few years as I grew up eating this in NZ where we call it 'silverbeet'. I was thrilled to finally find a packet of seeds available as I love the earthy taste of it in preference to spinach. I also grow Bright Lights but still prefer Silverbeet. Easy to grow, tasty and so versatile"
"Chard is delish! Better than spinach for flavor! I will be sowing some over the weekend where my squash plants bit the dust (dreaded borers got em). Can't wait to harvest the chard. It's so expensive in the store!" "We have planted four rows of Rainbow chard in our first allotment season. It is absolutely fantastic and thoroughly recommended for beginners! As you have said, it is very hardy and has survived although my first carrots and peas suffered badly! Great cropper - we have cut loads today to freeze too, so we have a lot to hand." "Lisa, How do you prepare it for freezing?" "My husband is a 'super-taster' of bitter substances, so he won't eat most greens, but he doesn't detect any bitterness at all in chard. We are growing 'bright lights' now." "Catherine, with huuuge apologies for my two year response - I strip the ribs, cut them into 3cm pieces and blanch them for about 2 mins, then bag up. I blanch the leaves for only about 30 seconds, before bagging separately. They flatten fantastically well in the freezer, and I pull out a bag or so to use in soups, stews, spaghetti sauce - anything really!"